Are you a little overwhelmed by all the rubber and blade choices? Confused about the rating or terminology? This guide should help you learn some of the terminology, and give you some suggestions on the equipment that might suit you. Although correct technique and practice is far more important than equipment for improving your game, you do need to select equipment appropriate for your level and style, so that it helps you develop your game, instead of stalling it. This guide is by no means complete, but should help you learn the basics, so that you can make a more informed choice. Inverted rubbers (also commonly referred to as 'Reverse rubber' or 'Smooth rubber' as it's smooth on the outside), is currently the most common used rubber, used by powerful attackers through to talented defenders. This rubber's versatility allows an extensive variety of stroke play. Offensive rubbers generate high levels of speed for powerful strokes and high spin, All-round rubbers generally have more control allowing you to play both an offensive and defensive style game, whilst Defensive rubbers are generally the slowest, allowing you to generate or manipulate the spin and control the pace of the game. 'Glue Effect rubbers' are a special type, generally for the more offensive style players, where tension is built into the rubber to give it extra speed (and sometimes extra spin) and a different feel, although these are generally not recommended for beginner or developing players. Inverted rubbers have a topsheet (smooth black surface pictured) and a sponge (yellow surface which attached to the blade), and are usually sold glued together already. Anti-Spin rubbers are a special kind of inverted rubbers that have a high immunity to spin, and are generally very slow, allowing you to control the pace of the game, and take most of the spin out of the game. It can also be useful for people that have a lot of trouble against spin. The final type of rubber are Pimple Rubbers (pictured on the right), the name referring to the pimples on the outside of the rubber, instead of the smooth surface of the inverted rubbers (which have the pimples facing inside). These types of rubbers are generally used to control or manipulate the spin in the game. Short pimple rubbers (also commonly referred to as 'short pips'), realises the fastest possible ball speed close to and over the table. They are most suitable for direct over the table hard hitting and quick speed - blocking where the generation of spin is less important. They generate less spin, but are also less sensitive to spin. They are popular with defensive, or combination bat players (player with very different types of rubbers on either side on the bat) who are capable of changing the rhythm of defense into attack. Long pimples rubbers, are primarily used to control incoming spin, making it easier to manipulate the spin by either returning the opponent's spin, or changing it when you return the ball. These rubbers are generally quite slow as well, allowing to change and control the pace of the ball as well. Compared to anti-spin rubbers, long pimples are generally take a little more adjustments to control the ball, but have more ability to manipulate the spin which makes them more dangerous. Medium pimple rubbers are somewhere between long and short pimples, having more offensive potential but not quite the slow pace and spin manipulation ability compared to long pimples. Rubber are usually rated according to Speed, Spin and Control, and can sometimes be chosen in a few options of Sponge Thickness and Sponge Hardness. The speed of a rubber generally refers to the speed that the ball comes off, for a loop or loop-drive type stroke. The actual speed that the ball comes off also depends on many other factors, including the blade, the stroke played, the sponge thickness and the speed of the incoming ball, but the speed rating is useful for comparing between one rubber and another. For anti-spin or long pimple rubber, where a 'loop-type' strokes is generally not played, the speed refers to that of a block or push. Rubber speed is actually quite complex, and cannot really be defined by a single number, but this is all we have, so we can use it as a general guide. As with the speed rating, the spin of a rubber generally refers to the spin on the ball from a loop or loop-drive type stroke. Spin is even more dependent on other factors besides the rubber spin rating, and is particularly sensitive to the stroke played and the speed and spin of the incoming ball, but again the rating gives some reference for comparing between one rubber and another. This rating is clearly the most controversial and misunderstood rating, and should not be given too much consideration. Manufacturers like to give high control ratings to all of their rubbers, even to their fastest and spinniest one, but in reality you cannot have a rubber that is both fast, spinny and with a high control. No rubber has it all, so you always need to compromise between speed, spin and control. The faster rubbers do generally have a lower control rating, but it's quite possible to have a rubber with both high spin and high control. NOTE: Unfortunately most manufacturers use different rating scales to compare the speed, spin and control of their rubbers, so the rating is really only useful for comparing between rubbers of the same brand. 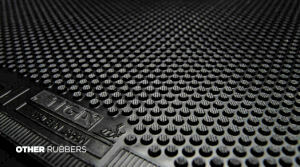 Rubbers consists of a ‘topsheet’ and a 'sponge', although in some cases (some pimple rubbers) only a topsheet is used. The topsheet is the outside of the rubber (red or black) that actually makes contact with the ball, whereas the sponge is the bit between the topsheet and the blade. Sponge thickness can often be selected when you purchase a particular type of rubber, although sometimes there is only one choice. In general a thinner sponge will give you more feel and control of the ball, whereas a thicker sponge can potentially give you more speed and spin. The increase in speed and spin mainly applies to loops, so if you don't loop, you may not get much benefit from a thicker sponge. For beginner and developing players, a thickness from 1.5mm to 2.0mm is recommended, as the control and feel of the ball is far more important than the maximum speed or spin. Some rubbers come with hard sponges, some with medium or soft sponges, and in some instances you can even select the sponge hardness for a particular rubber. In general (and there are many exceptions), softer sponges tend to give you more feel of the ball, are more forgiving and make it easier to generate spin. Harder sponges give you more offensive power, and offer higher spin potential even for very hard shots. For beginners and developing players, neither a very soft nor very hard sponge is recommend. A sponge too soft for these player is too forgiving and encourages lazy technique, and also makes it hard to power-loop since the rubber will 'bottom out' ('bottoming out' refers to the sponge compressing so much that it's no longer got the spring to generate spin on release). A sponge too hard makes it harder to control and feel the ball, which is vital for developing players. NOTE: Unfortunately many manufacturers use a different scale for measuring sponge hardness than others, making it very hard to compare. The 2 most common scales are the Chinese scale, ranging from about 30degrees (soft) to about 45degrees (rock hard), and the Japanese/Euro scale, ranging from about 25degrees (ultra soft) to 55degrees (hard but still considerably softer than the Chinese 45degrees). Some people think that the higher-priced Japanese or Euro rubbers are always the better choice, since the more expensive ones must be better. Although these rubbers are generally of better quality, a Chinese rubber may be a better choice for your style of game, regardless of the price differences. The most common combination of rubbers for the Chinese National players (who have dominated the top 10 for the last decade or so) is a hard tacky Chinese rubber on the forehand, and a softer Euro/Japanese rubber on the backhand, so this clearly illustrates that both types of rubber have a place in table tennis. In general (and there are now many exceptions) Chinese rubbers have a tacky (sticky) topsheet with a harder sponge, whereas Japanese/Euro style rubbers have a grippy (but not sticky) topsheet, with a softer and more lively sponge. The difference between the two have become more fuzzy in recent years, as the Chinese have stepped up their quality and have also added new rubbers to their range, which are much closer to the Euro/Japanese style ones. Similarly the Euro/Japanese now make some Chinese style rubbers, as they realise there is a demand for them. Generally speaking the main difference between the 2 types of rubber is that the tacky surface of most Chinese rubbers makes it easier to generate high spin for serves and pushes, and the slower sponge gives better control in the short game. The grippy surface and more lively sponge of the Euro/Japanese rubbers make it easier to generate pace and the softer sponge allows you to ‘feel’ the ball better. Looping with these rubbers takes less effort and can be done with a more compact stroke, whereas Chinese style rubbers reward a bigger and more powerful stroke. Which rubber suits you better depends very much on your style, level and what rubbers you’re used to. OOAK shop specialises in custom designed table tennis bats, and since we're one of the few shops that do our own testing (with decades of experience), we are experts designing blade & rubber combinations that combine perfectly. Although you can always contact us for advise on a bat tailored to your specific style and level, we've created a (growing) numbers of rubber and bat combination in our table tennis bats section, which may already have a bat that suits your level and style. The section is subdivided in to beginner, intermediate and advanced level, and the description tell you the style of play it's designed for, so there is a good chance you may find something suitable there already that's within your budget. Below are some more blade and rubber recommendations that are commonly asked about, along with the reasons we recommend them. 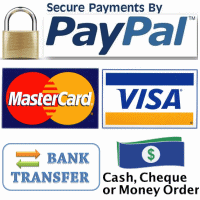 Of course there are many options for every style, and if you need more advice, feel free to contact us for a chat. Note that everyone perceives how a rubber plays a little differently, depending very much on your style and previous rubber experiences, so use the recommendations below as a guide only. (1) Defensive style - The classic 729 FX rubber with a thin sponge (1.0mm or 1.5mm) offers great control, high spin and still some offensive potential. For super defensive, combine with the LKT Toxic 3 blade, or for something a bit ore all-round, try the LKT Instinct or the Blackwhirlwind and you've got a great defensive setup at a low price. (2) All-Round style - The 729 FX Lightening offer good all-round potential at a low price. Combine this with a Galaxy N-10 blade or a 729 Bomb blade, and you've got good offensive potential but enough control to play defensive strokes with high control. (3) Offensive style - For a fast offensive game at a low price, it's hard to beat the 729 Battle II or the Hurricane 3 Neo, as they're among the fastest Chinese rubbers around. Combine this with the 729 Bomb blade, and you've got a fast and high quality combination at a great price. B) Price is not as important as performance, I want the best! (1) Defensive style - For choppers the TSP Triple Spin Chop Sponge offers outstanding control and spin abilities. For those that like to chop but also like to mix in some blocks and occasional spinny loops or hits, the Donic Desto F3 Big Slam or the Vario Big Slam both in 1.8mm offer great chopping ability with some good offensive potential too, especially for smashing. Combine this with a top quality defensive blade such as the the Victas Koji Matsushita and you've got a top quality defensive setup. (2) All-Round style - There aren't that many rubbers classed as 'all-round, but many offensive rubbers, used with a thinner sponge are excellent all-round rubbers. For example the Yasaka Mark V or Donic Coppa in 2.0mm on a Donic Walner AllPlay blade makes a top quality all-round bat (although leaning towards to more offensive). (3) Offensive style - If you want great speed but still good feel and control, it's hard to go past the Darker Hinoki blades, which are made of the highest quality materials but among of the Japanese Master blade makers. Particularly the 1-ply blade like the Darker Speed 90 will give huge speed while still offering some dwell for spin and control. The types of blades tend to combine well with softer tensioned rubber, particularly with thinner sponge (like 2.0mm) as maximises the feel and control of the blade, while giving it plenty of spin potential. Something like the Donic Acuda S2 with a 2.0mm sponge combines very well. (1) Close to the table - Balsa blades are great for this, as they offer good control when you hit the ball softly, but huge speed when you apply only a little effort! Blades like the TSP Black Balsa 7 or the Donic Black Devil are light weight but offer huge speed close-in. Although this blade will feel fast with most rubbers, a short pimple rubber like TSP Spectol 1.8mm or 729 802-40 1.5mm works great for flat hits and is very insensitive to spin. 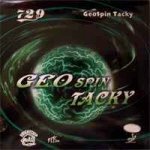 If you need more spin, a tacky rubber like 729 Geospin tacky 1.5mm will work very well as well. (2) Long distance - If you want high speed potential as well as good spin for fast powerlooping, the 1-ply blades like the Darker Speed 90 combined with a fast rubber like the Tibhar Evolution MX-P or the Donic Bluefire M1 would be hard to beat, but we won't be responsible for the holes you punch into your opponents! For something still powerful but a bit easier to control would be the Avalox P700 blade with similar rubbers. For a more hitting power rather than power looping style consider the Yinhe T-1s Carbon blade combined with Victas V>01 Limber for huge hitting power, while still being able to produce high spin loops at lower speeds. (1) Close to the table - A long pimple rubber on one side, combined with a spinny rubber on the other tends to make one of the trickiest combinations you can find. The Re-Impact blades offer the among the best for this style of game, as they are light weight (aids quick movement), one side significantly slower than the other (greatly improved control of pace) and are optimised for long pimple rubbers. Although these blades are a little more expensive, they are hand-made in Germany, and offer something truly unique. Combine the famous Re-Impact Tachi blade with a long pimple such as Tibhar Dtecs (OX) or Spinlord Dornenglanz (OX) and a soft Tensor like Donic F3 Big Slam 1.8mm on the other side for spin and hitting power and you've got one of the most deceptive combination you can find (with the right technique of course!). (2) Away from the table - A long pimple (with sponge) that has high control against loops and great potential to vary and even generate some spin, would be great for chopping away from the table, and as the TSP Curl P-1R is the most common choice even at elite levels! Using 0.6mm sponge will give you more control, 1.0mm or 1.5mm will sllow more variation and the ability to generate spin. For a more defensive style, the Victas Koji Matsushita would be a top choice, or for a bit more offensive power, try the Victas Koji Matsushita Offensive. Combine this with a Powerful and spinny forehand rubber, like the Joola Golden Tango or the ultimate chopping rubber the Victas VS 401, and you can chop with good control and high spin, but attack fast and spinny when the opportunity arises. This is a common requirement even at the top level, and a lot of the top ladies use a short pimple only on the backhand that suits this style perfectly. A blade that works perfect with this style of game is the Avalox P700, as it's a little stiff (great for blocking/hitting) but has a soft feel with good catapult for a powerlooping game. The TSP Spectol (or the Spectol 21 or Speed as options) is one of the top rubber for blocking and hitting through the spin, and has high control and low sensitivity to spin even for return of serves! With a powerful and spinny rubber on the forehand, like Victas V > 15 Extra or the Tibhar Evolution MX-P and you've got a top quality and highly effective weapon ideally suited for this style. This style is most effective close to the table. The Avalox/ AVX range of blades are hard to go past for some the top looper's blade, even at the top levels of table tennis. The blades tend to have a soft feel, have a little flex but are still powerful enough to power-loop or put the ball away. For an offensive but maximum spin and control blade the Sweden-made Avalox P500 or the Blue Thunder 550 are among the top choices. For a more powerful but still with high spin and control, the Avalox P700 or the Ma Wenge C555 are among the top choices. This blades will work very well with either Chinese or Euro/Japanese rubbers, depending on your personal preference. G) I can't handle spin, what equipment will help me cope? Although my first recommendation would always be to get some coaching, if you've already tried this, or this is not an option for other reasons, you can choose equipment that will help you make spin easier to handle. There are 2 basic options, (1) choose inverted rubbers which are simply less sensitive to spin which will make it easier to handle, or (2) choose an anti-spin or pimple rubber which can help you turn your opponent's spin against them. (1) inverted rubbers less sensitive to spin - Something like Donic Coppa or the good old Yasaka Mark V are non-tacky and relatively insensitive to spin, even though you can still generate good spin with them. For a cheaper Chinese option you could consider the 729 Focus 3 Snipe. (2) Antispin or pimple rubbers - The JUIC Neo Anti or the Tibhar Ellen Anti Spin are excellent choices, as they are insensitive to spin, take the pace off the ball, easy to use, and they tend to take the spin off the ball, which often troubles the opponent as they don't expect this. Long pimple rubbers are a little trickier to use, but are also trickier for your opponent as they return some of the spin back to them. SpinLord Dornenglanz or CCT National Pogo are among the easier ones to use, and are very effective. For maximum effect use them without sponge (called OX) or choose the thinnest sponge option for good control and easier to use (if you come from inverted). A light bat usually means you need a balsa blade, as balsa is one of the lightest woods and is commonly used for the inner plies of blades. 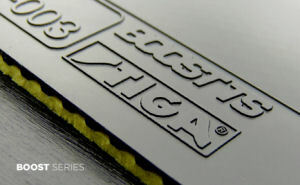 The Re-Impact Blades are ideal for people that have these special requirements. Not only are they high performance and specialised blades, but many are ultra light (50-60g! ), and their shape lowers the centre of gravity making it feel even lighter in your hand. Combine this with a thin rubber for defensive styles, or a soft and light tensor for a fast offensive game (or one of these on either side for a high-end combination bat) and you'll have a bat that exert minimum strain on your arm/wrist/shoulders but can still perform at a very high level! (I) I'm a developing player, and need a quality bat with a good balance of speed, spin and control that won't hold me back.